In sticking with my New Year's resolutions, here is a plant-based meal that we are loving these days. Surprisingly, this meal is very filling and packed with flavor. Serve it with a salad loaded with fresh greens and a light lemon dressing and your dinner is all set. While there are multiple steps to making this meal, it is very simple and does not take much prep time. In fact, the purée and chimichurri sauce can even be made a day ahead of time! 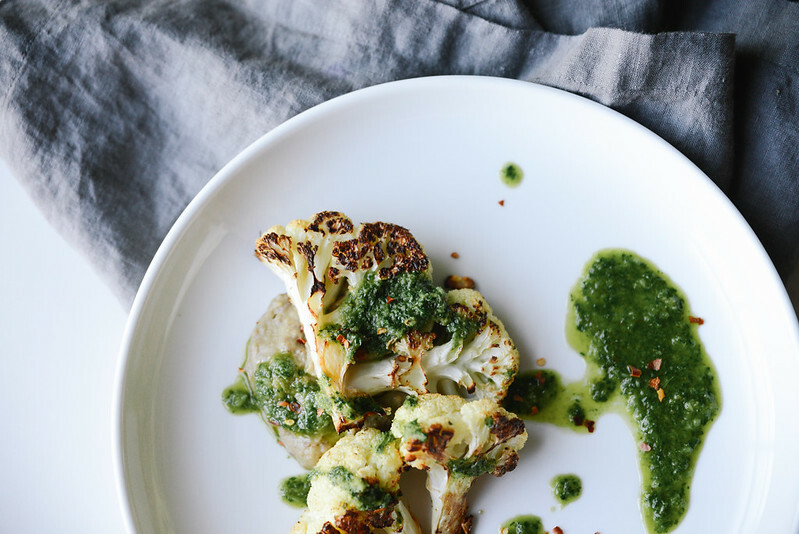 Cauliflower is a weekly staple in our home. Because of it's subtle flavor, this superfood accompanies any style of dish, combines well with any sauce and can easily be made into rice or a mash. It also totes a lengthy list of benefits. It can reduce your risk of cancer. Cauliflower contains sulforaphane, an anti-cancer compound in cruciferous vegetables that contains potent antioxidant and anti-inflammatory elements. It has also been shown to kill cancer stem cells, therefore slowing tumor growth. Some researchers believe eliminating cancer stem cells may be the key to controlling cancer. Cauliflower also fights inflammation, is high in vitamins and minerals (including Vitamin C and K), boosts brain health and aides in digestive health. 1. Preheat oven to 400 degrees and line a baking sheet with parchment paper. Cut cauliflower into about 1 inch steak slices and arrange on a baking tray. 2. 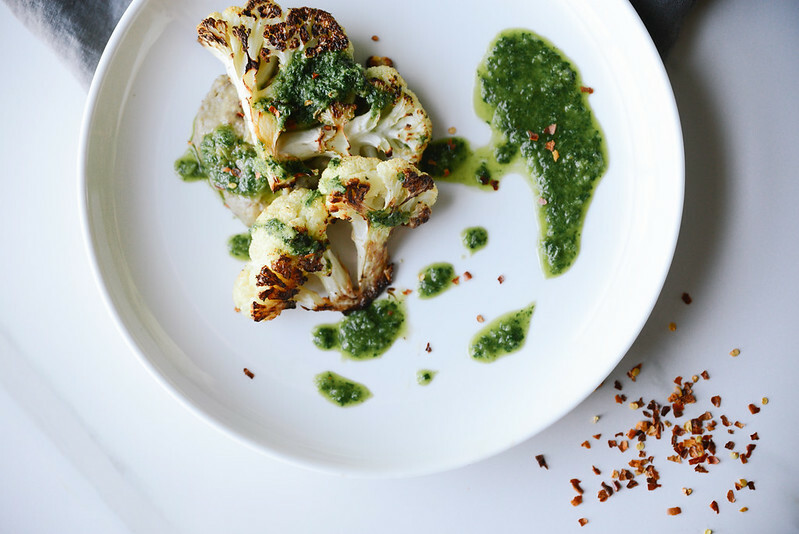 Combine oil and spices and drizzle over the cauliflower. 3. Bake for 20 minutes, flip over half-way through cook time to ensure equal browning on both sides. 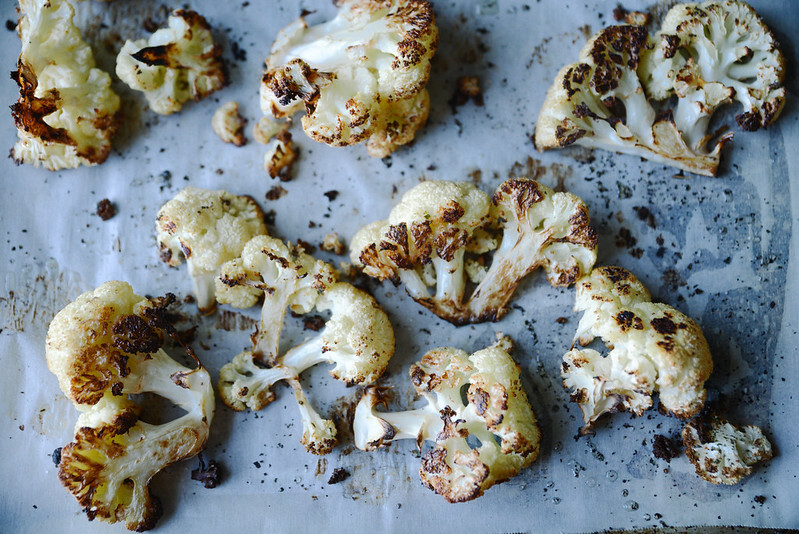 Cauliflower should be tender and lightly browned on each side when done. 4. While cauliflower cooks start to prep the eggplant dip. Slice eggplant in half and place on a parchment lined baking sheet. 5. Drizzle eggplant with oil, salt and pepper and bake for 20 minutes, or until tender and slightly browned. Set aside to cool. Purée in a vitamix or food processor, adding a small amount of olive oil until desired consistency. 6. Make the chimichurri sauce. Place all ingredients in a blender or Vitamix and blend until smooth. You may have to adjust the oil and vinegar to get your desired consistency. Use a spatula to scrape down the sides as you blend. 7. 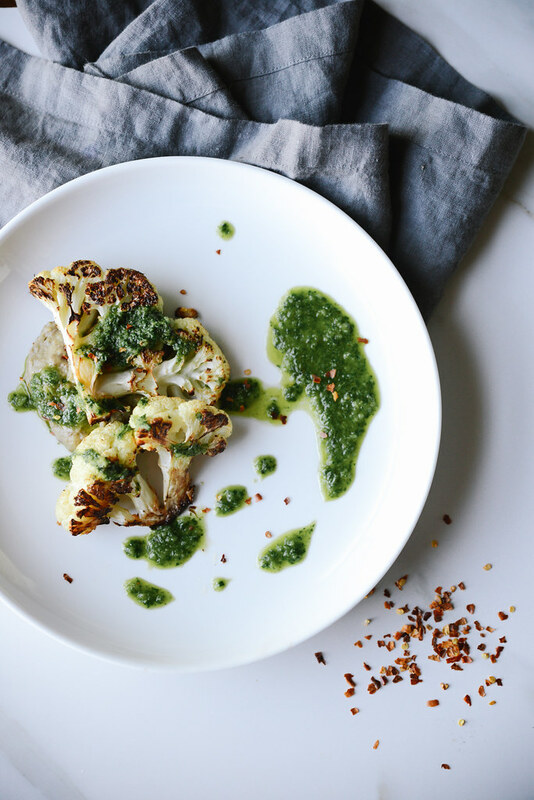 When plating up, place a dollop of eggplant purée on the plate, place the cauliflower steak on top and add the chimichurri sauce. Garnish with red pepper flakes and parsley. *I use avocado oil for roasting because it has a high smoke point, is loaded with vitamins and minerals and boosts nutrient absorption. Lately, I've been using this brand on Amazon. * Store the chimichurri sauce in an airtight container for up to 2 weeks in the refrigerator. Use on roasted veggies, steak, chicken or fish. * Use the leftover eggplant purée as a veggie dip. * This post contains affiliate links. When you purchase an item that is linked in a recipe (or elsewhere) I may receive a small commission. This does not result in an increase of the sales price of that product to you.